There was this little restaurant called Savoy that OB and I would go for breakfast when we lived in Tulsa. They served a massive cinnamon roll and has the best breakfast nachos ever! 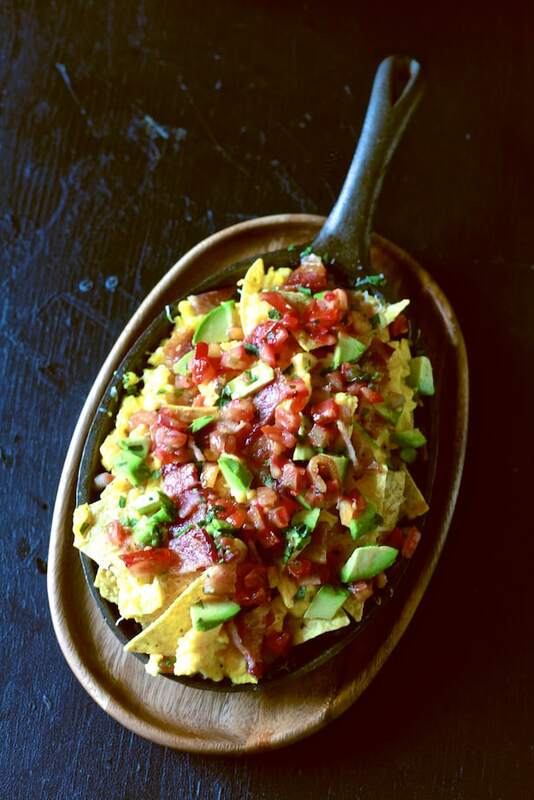 They fried the tortilla chips fresh and loaded them up with eggs, cheese, bacon, avocado and salsa. And, we always requested extra sides of salsa. These breakfast nachos were utterly perfect. Unfortunately I can no longer roll out of bed on a Saturday morning and run over to Savoy for a plate of breakfast nachos. According to Google Maps it would now take us 4 hrs 25 mins to get a plate of Savoy’s breakfast nachos. Although I have considered this option, because I love their breakfast nachos that much, I came to my senses and instead ventured out to my local grocery store. I wondered to myself, “What it is about breakfast nachos that I love so much?” and I realized that the crunch is a big part. I adore crunchy food and I have a firm belief that all food should have some type of crunch, crisp or bite. Food without texture to me is boring, which is probably why I’m not crazy about oatmeal. Many times I will have a craving depending on the texture of the food, instead of the food itself. So, it’s not a question of Italian, Chinese, Greek or Burgers, it’s a question of creamy, soupy, crunchy or crisp. There was a time that I craved food according to how it was eaten, hands, chopsticks, fork and knife or spoon. Thank you for bearing with me in my weirdness. 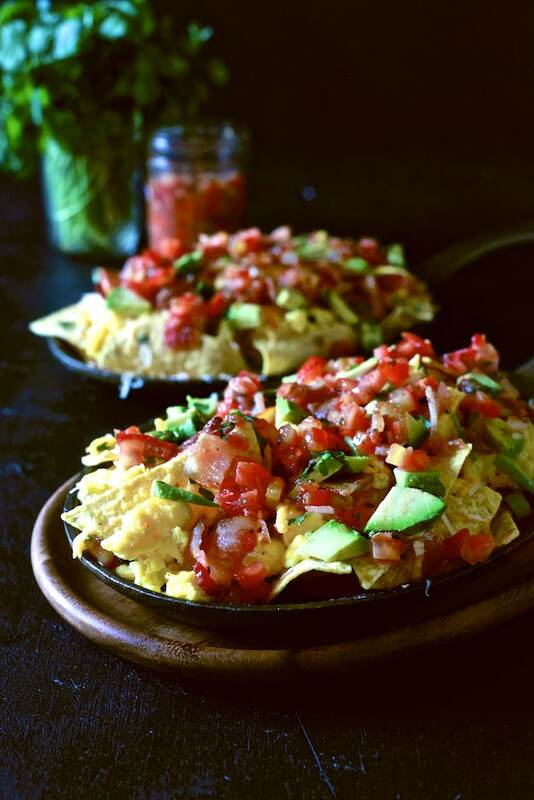 Breakfast nachos most definitely meet my crunch and texture requirements. 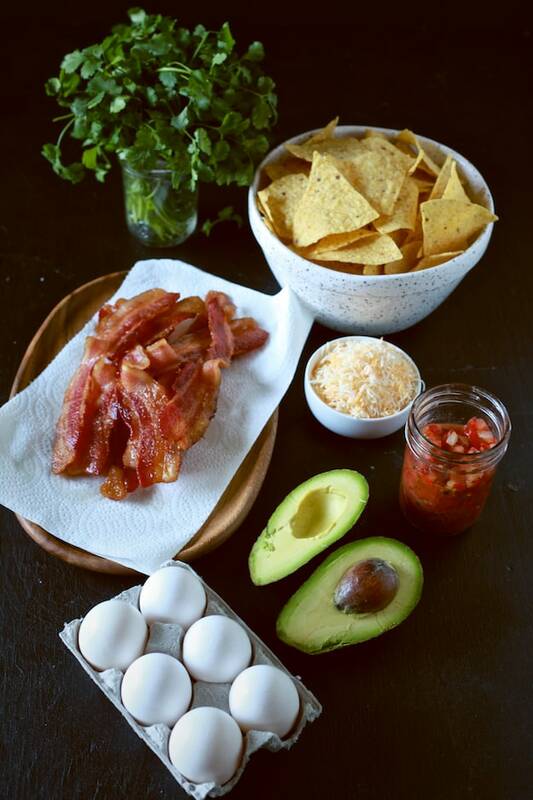 This mountain of nachos as it all, crispy tortilla chips and bacon, creamy avocado, gooey cheese and fluffy eggs. All of it topped off with a bright salsa. 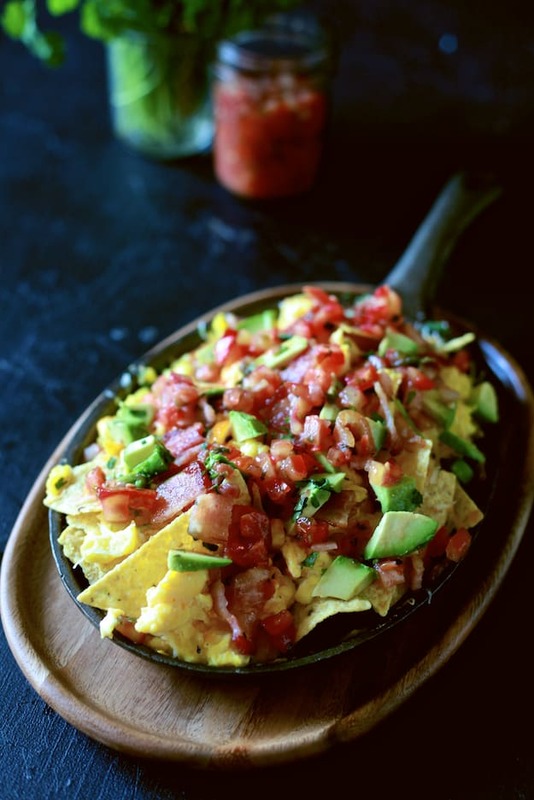 I swoon with love over these breakfast nachos. 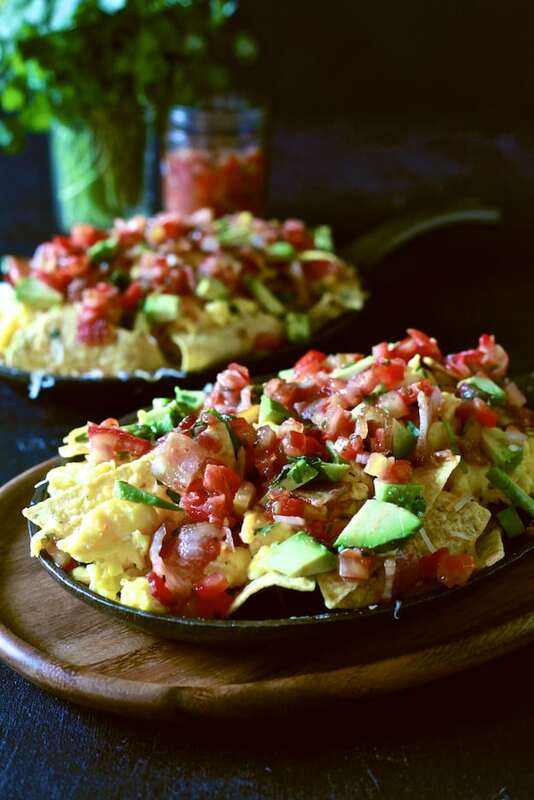 Breakfast nachos are a great way to change up breakfast without having to go too far out of the box. The likely hood is that you have all of these items on hand and all you need to do is pile them up and enjoy. And, they are simple enough to change up and make your own. Substitute sausage for bacon, use pepper jack instead of cheddar, add black bean and corn salsa and if you’re not a fan of tortilla chips try using tater tots! I myself am not a fan of tots, but I’ve heard that some people love them. Oh wow. I don’t even know what else to say, love this!